We all know what reduction firing is, right? Or do we? The science of what happens in a reduction kiln and the resulting color palette might not be exactly what you think it is. When I read Ryan Coppage’s article on reduction firing in the March 2016 issue of Ceramics Monthly, I realized that I didn’t have the definition exactly right. So I thought I would share an excerpt from the article in this post. After all, really understanding what’s happening in the kiln can only lead to better results! – Jennifer Poellot Harnetty, editor. With access to enough oxygen to efficiently burn your fuel, you are almost exclusively producing water vapor and CO2, which will cause oxidation of your ceramic surfaces. This is the clean-burning, efficient, blue flame, which is why easy temperature gains are synonymous with oxidation atmospheres. Upon limiting the amount of oxygen access to the inside of your kiln via vents, flue control, or passive dampers, you are no longer producing purely CO2 from your fuel; you are now producing carbon monoxide (CO) and carbon black in the form of soot and char (C:H compounds in the ratio of 8:1 or so). Your flame is bright orange (1A) and you can see smoke and soot often rolling up and out of the kiln. Conversely, a fully oxidative flame is bright blue (1D), with transitionary flame compositions between the two (1B, 1C). CO and soot both deliver electrons to the surface of your pottery in the kiln. CO reacts with oxygen at the surface and forms CO2, leaving electrons behind. Soot will flow and adhere to the surface of whatever it touches in the kiln as incredibly small, free-radical black carbon particulate. As small carbon particulates build up on pottery surfaces, they begin to aggregate as soot and oxidize, causing a small flow of electrons into the ceramic surfaces. These processes result in the metals in your glazes gaining electrons, which means the net charge or oxidation state is reduced. Potters take advantage of this atmosphere for reducing oxidation states of metal colorants, soot production in carbon trapping, and more specialized glaze effects via soaking. carbon, carbon trapping, ceramic, ceramics, charge, clay, color, colorants, colors, element, firing, firing process, flow, flue, form, forms, gas kiln, glaze, glazes, hydrocarbons, kiln, natural, oxidation, oxidation firing, oxidize, palette, potters, pottery, process, reaction, reduction, reduction firing, reduction kiln, results, set, setting, share, soaking, surface, surfaces, water, water vapor. I use between B and C at the flue, works great, make sure you have back pressure and see flames coming out the front ports too, the flame will be quite large at the top and smaller at the bottom port. If you want green stop reducing, sawdust will reduce, don’t produce all that smoke/Carbon and your Cu pot will be green. I know this was some time ago….and much as this helps with what reduction atmosphere means…. any chance of finding recipes for glazes using this method please??? Reduction firing is a science in it self. Getting a good reduction firing is difficult. I have been doing a lot of Raku and have had to learn alot about reduction. I tried doing cone ten reduction glazes in a gas kiln and that became to difficult to get a good reduction. I have been having better success with Raku. You have to know a lot about chemistry. I have done a lot of praying to the kiln Gods during a firing. You may have had your flue too small/blocked as well, or gas pressure too high for the existing flue. I’d check that by just pulling piece and not putting it in the can. If it’s red, you reduced too much in the firing. Also consider less flammables in the can. I recently had a chance to watch Terry Hagiwara, who is a well-known Raku guy here in Houston, and he just puts a few sheets of newspaper paper on the floor of the can. Please keep the chemistry coming. I know that for those who haven’t had formal education in chemistry the language of chemistry needs translating but that’s a good reason to translate, NOT a good reason to abandon chemistry in articles. Wendy did a great job of translating some of the points that tom Mogensen made in his posts. Everybody wins. Chemistry, Physics and even Biology (all that saw dust) are a huge part of ceramics and they more we all learn the better and more exciting the art becomes. Thank you for this information! I’ve got a bit of chemistry in my background and know my way around the table but when you’re dealing with bits of eclectic information it’s hard to know if you’re reasoning your way through or just shooting in the dark with just enough info to be dangerous. Nice topic and well-stated! Redox reactions actually involve a lot more than just the Oxygen and Hydrogen. Sulfur for example can steal electrons and is an Oxidizing agent. 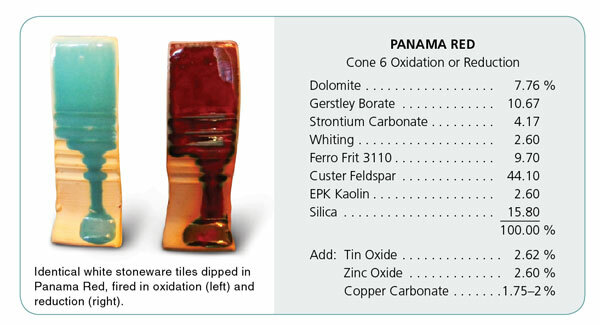 Anything on the far right side (Except the last column) of the periodic table can “Oxidize” the ones on the left columns. The ones on the left like to donate electrons. There are many different elements and compounds in the mix inside of the kiln and the clay and glazes all interacting making new compounds and forming crystals within the glass at their specific melting point temperatures on the way up then melting and dissociating and reforming on the way down. The longer you leave it at the melting point of a given crystal the larger it will become. When the metals (Left side) give up their electrons – actually sharing them – they no-longer seem like metals. Iron Oxide good example. When we force them to take back their electrons – reducing them – they become metallic in character again. This is what starving them of oxygen in the firing essentially does. Green and red come from copper (Cu) reduction will turn copper red, oxidation will usually be green. Sounds like you reduced MORE than you thought, i.e. left in the sawdust.if you want green you can try putting in trash can with no sawdust/ combustibles, with lid loosely on, or even off, depending on outside temp, so less chance of breaking in open air. Unless you’re into that risk, some people are. You can also line the bottom of the can with soft brick to protect the bottom of the pot. If you gets mottled redish, livery green, you are somewhere in between ox & redux. Wow. And so many people are trying to get red and failing! Could be your sawdust, too. Lots of additives in the wood industry are acidic; stir in some alkalines and the alkaline blue-shift might overpower the reduction red-shift. Long story short, the color differences between oxidation and reduction are because reduction produces a “dirty” environment, and that “dirt” works into the glaze and changes the color, not because the reduction environment is “stealing” oxygen from the glaze. Explains why different heat sources create different effects (If it were a matter of taking stuff OUT of glaze, the heat source wouldn’t be as significant). Also explains why so many methods to reproduce it with electric kilns are hazardous to the coils. Wow, that surely clears things up! Amazing process. My last Raku pearls are turning to copper red colour. Beautiful, thank you for explanation!! Yeah, it can be understood in terms of gaining or loosing electrons, but that only makes sense when you realize that it is a matter of two kinds of atoms sharing their electrons. When oxygen is attached to, say, a copper atom, it grabs electrons from the copper. When you pull the oxygen off into another molecule, it gives those electrons back to the copper. In the end, I, also, prefer to think about the oxygen atoms rather than the electrons. The reaction equation lacks its arrow. Helpful in some ways, “duh-what” in others. I only have high-school chemistry and had to cast back a long way to retrieve that! Does give me an insight into achieving dense or light crackle. Yeah, but which one of the A, B, or C is “best” for reduction firing or do they all work equally well? A is obviously reducing like crazy but I burning a lot of fuel and is probably a lot colder and less efficent than C. If A and C are both “good enough” you should probably go with C, but this excerpt gives no actual guidance as to which of A, B, or C you should use. In terms of what to shoot for when reduction firing this is next to worthless. Thank you for that wonderful explanation! It is cool to know I am not pulling oxygen out but adding electrons to my pots! Its fun to think about to think about! It also helps me to see how a heavy reduction will affect my pots versus a slight reduction. My work is very Sci-fi based so this will inform my work going forward. Love it! My ‘parallel and incidental’ explanation is good enough for me! I think this is a very difficult proces and has posselt me often when firing RAKU copper glazing. Well, that’s as clear as mud! !